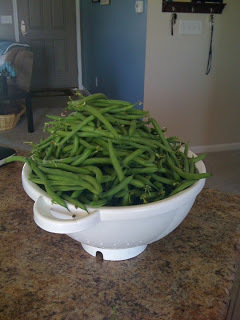 Green beans harvested a couple weeks ago. 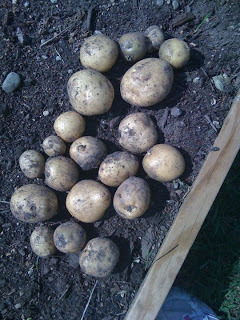 Here’s my potatoes I harvested today. I had one with my lunch and it turned out yum-ummy! So it looks like I’m making a meal with potatoes tonight! I also made a veggie sandwich today with home-grown cucumber and onion, green pepper, and it was good too! I love fresh vegetables and fruits. I also went blueberry picking with my mom a couple weeks ago and picked 9 pounds. I already made a couple of things with them and they are yummy too. 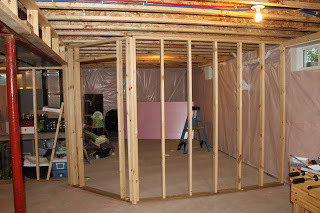 Also, we got work done on the basement with the help of Jordan Mansfield last night. Now we have another room in the basement! It helped a lot cause we couldn’t do anything till that got done. Here’s the future workout room! I like the angled door. 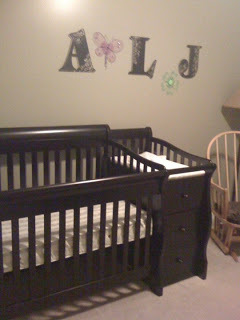 We also got our crib put together this last weekend and got Abigail’s room up and going! I think it looks really good! Here’s a pic of part of it. One cushion is done for my glider thanks to Kyle’s mom! 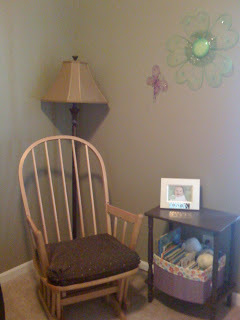 I’m getting excited to see Abigail…less than 10 weeks to go!